So you’ve signed up for your first Civilian Military Combine. Congrats! Now you’re wondering, what did I just get myself into and how do I make sure I’m prepared? Well, that’s where we come in! We’ve got about 8 weeks to get you CMC ready, so we’ve put together an 8 week training program that includes conditioning, strength, endurance and skill work that will have you ready to crush both the Pit and the obstacle course on May 17th. The graphic above gives a breakdown of how each week will look. Each Friday, we’ll post the program for the following week in here. Below is a description of each of the different program elements. Conditioning: This will typically consist of a shorter run or row or interval training. The objective is to get your body conditioned for the obstacle course as well as the Pit, and to test your work capacity after completing the Pit. Strength: Tomorrow, we’ll be posting details on how to create a strength program, so stay tuned. If you’re relatively new to strength training and going to be doing it once or twice a week, we recommend that each session be full body. This will also ensure that you’re not focusing only on arms or legs one day so that you’re too sore to continue training the next day. Tuesdays we recommend performing fewer reps at slightly heavier weights to focus on building strength. Each strength session, we will recommend a movement that you should incorporate. For example, pull-ups, dips, seated row, etc. Skill work: These will be focused on getting you ready for the obstacle course and will include things such as farmers carries, bear crawls, rope climbs, tire flips, etc. We know that everyone might not have access to all of these things, so we encourage you to get creative! Endurance: This will be a longer conditioning piece. We’ve included recommendations – stairs, run, row, etc, as well as a time period or distance. Rest Day: This is just as important, if not more, as the other days! Your body has been working hard the past three days and needs to rest! Spend some time mobilizing. (we’ll post more on how to do this later) or get a massage. If you really need to move, go for a walk or a yoga class. Then rest up so that your body is ready to go hard for the rest of the week! a2aWOW: We’re going to continue posting our a2a Workouts of the Week, and this time they will specifically be catered to getting you ready for the CMC. Conditioning: Friday’s conditioning piece will usually involve stairs. The Poconos course is not flat and we want you to be ready to climb! As we progress, we’ll add objects for you to carry while climbing the stairs. These can be done on a stairmaster/stepmill or outside. Strength: This is your second strength session of the week and we recommend performing more reps with lighter weights to increase your muscular endurance. Again, we will suggest movements that you should include. Skill Work: Similar to Tuesday, we will recommend a skill for you to practice. Rest Day: You’ve worked hard this week! Spend some more time on mobility, eat something yummy, and get ready to get back to work on Monday! 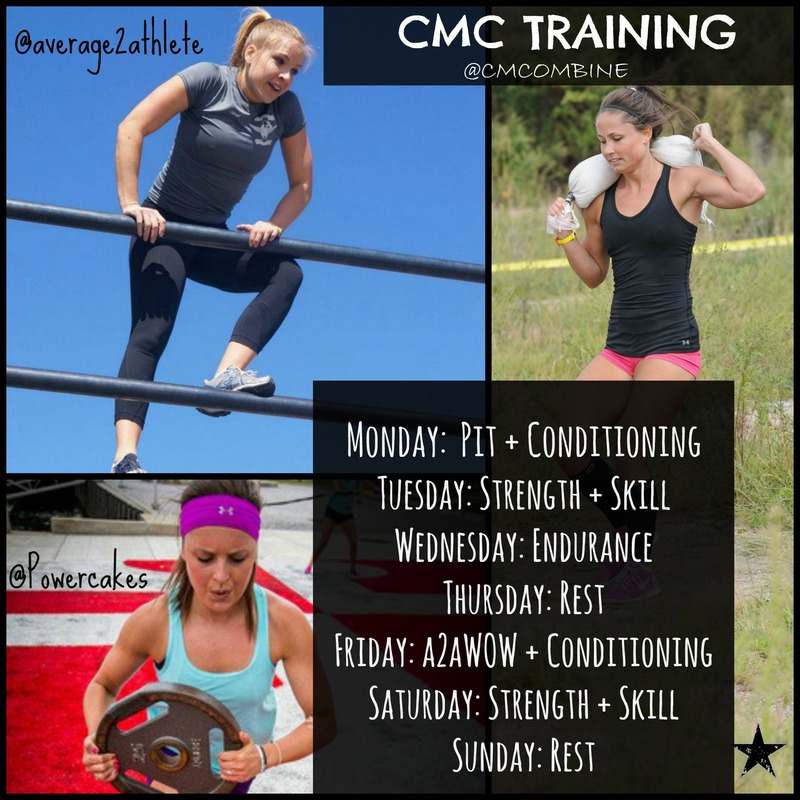 We hope this gives you a good picture of how we would recommend training for the CMC. Obviously, we know everyone’ s schedules are different. You might not be able to start your week on Monday and rest Thursday/Sunday, and that’s fine. Adjust how you see fit. Don’t want to skip out on your favorite spin class? Totally cool – there’s your endurance! High Intensity training studios such as the Fhitting Room (aka come to Julia’s class!) are also great ways to work on your conditioning and muscular endurance. In addition to the training program, we will be posting weekly tips for you, which will include ways to be efficient in the Pit, what to wear on race day, nutrition, etc., so follow us on Instagram – @average2athlete and @Powercakes – to be kept in the loop. Finally, be sure and check out our Meet-ups page, where you’ll find opportunities to come practice the Pit with us! For those of you in the NYC and Pittsburgh areas, once the weather breaks, which it looks like it finally might (finger’s crossed! ), we’ll be hosting meet-ups outside as well. Stay tuned for more dates! ← CMC 101: What is it and why should I care?